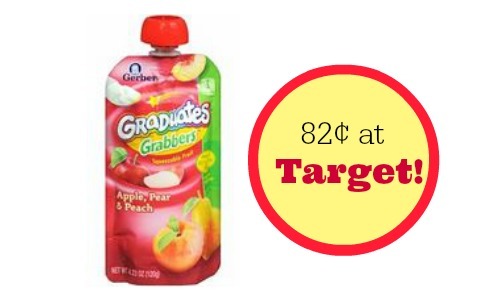 Home > Printable Coupons > Gerber Grabbers Coupon | 82¢ at Target! Gerber Grabbers Coupon | 82¢ at Target! There is a new coupon available to print to save $1/3 Gerber Graduates Grabbers. There is also a Target Coupon available to stack and a 10% Off sale at Target thru 6/7 on all Gerber Graduates foods. The price might vary slightly based on the area, but you should be able to get the baby food pouches for around 82¢! This is a great deal for food for the little one, so go ahead, print your coupons and head to Target!